The following is a review of the Netflix Original Film “The Ridiculous Six”, a Frank Coraci & Adam Sandler film. Netflix has been great at releasing binge- and stream-worthy content for years. House of Cards, Virunga, and Beasts of No Nation are examples of Netflix bringing excellent original content to screens around the world. Netflix has slipped up before, not every season, documentary or stand-up special works, but I believe that The Ridiculous Six might be the worst thing they’ve ever released as original content. 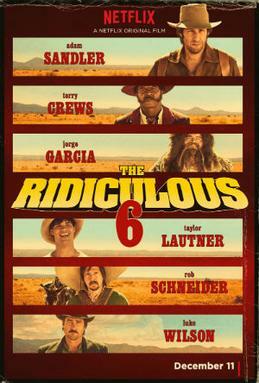 The Ridiculous Six follows Tommy “White Knife” Stockburn (played by Adam Sandler), an orphan raised by Native Americans, as he tries to bring back his kidnapped biological father (played by Nick Nolte) who may have more than one son out there. That is the basic premise of the newest entry in the line of films attempting to bring back the western as a viable genre in Hollywood. Trust me when I say that The Ridiculous Six will not help the western-genre in any way. The Ridiculous Six is one of the worst films of 2015. There are a lot of reasons why this film simply does not work, and it all starts with Adam Sandler’s character, White Knife. White Knife, as a character, does not earn the smarts or gifts that he has, and the ‘powers’ that Sandler’s character possess are absolutely absurd and misplaced in this film. Sandler is a problem as well. He doesn’t give a good performance, he is miscast as White Knife, and he is incapable of leading this strange film. But this is a western-comedy, and therefore the humor could save this film. However, the film just is not funny, and the humor is as bad as you expect: there are a lot of jokes about donkeys, intelligence, poop, and the intelligence of overweight people. This is the type of comedy which may work on paper, but as a full-fledged film it doesn’t live up to expectations. In fact, this concept and these jokes would’ve worked a lot better as vignettes in a sketch show — albeit in a sketch show that I would never want to watch. What is the saddest thing about this film? Perhaps the fact that the jokes and the direction waste one of the best comedy casts I’ve seen in quite a while. Nick Nolte, Steve Buscemi, Terry Crews, Harvey Keitel, and Will Forte deserve much better than what they ultimately got from this film. But Adam Sandler has an audience, and some people may like the humor in this film. The fact of the matter is that I really like Adam Sandler and Frank Coraci: I really enjoy The Waterboy, Click, and The Wedding Singer. But this film was incredibly problematic, and the length of the film gives it away. Two hours of bad comedy in a beautiful western setting simply is too much, and I found myself staring at the screen wishing they would’ve cut some of the throwaway dialogue or terrible sketches. One of these sketches involves the creation of baseball, and it is one of the most painful scenes of 2015. I could not wait for the film to end. 3 out of 10 – a huge disappointment, and possibly the worst film of 2015.